I was teaching a Zumba class at our local YMCA the morning of February 21, 2013. Just a few songs into the class, I felt a little “off balance.” I thought shake it off and keep going. Seconds later, I collapsed. I felt embarrassed, confused and told my room full of Y members to give me a minute and we’d finish class. I tried to stand up and fell again. My legs wouldn’t work! I was still trying to figure out what was happening. Then, my jaw and hands locked. That is the moment I felt panicked and knew something was terribly wrong. An ambulance was called and I began asking friends to get in touch with my husband who was out of town for work and other friends to make arrangements for my two sons after school. I remember being put into an ambulance but the next two weeks are a blur. I was taken to a nearby emergency room. The ER doctor suspected an aneurysm and ordered scans. A cranial drain was placed in my head to relieve pressure of blood and spinal fluid on my brain – the culprit of my inability to stand. I had suffered a subarachnoid hemorrhage. After a few hours trying to stabilize me, I was transferred to Carolinas Medical Center in Charlotte. I spent almost four weeks in the neuro-ICU enduring tests, scans, etc. daily. On day 26, the vasospasms had subsided enough I had a chance of surviving surgery to place a Pipeline Embolization Device (PED). My aneurysm had ruptured so there was nothing left to repair or clip. The PED reinforces the now shredded artery. My surgeon is one of a handful trained for the procedure. He saved my life. I used to say I am so lucky to have survived, but a relative corrected me that I am blessed. If this had happened on a day I wasn’t teaching, I most likely would not have made it. I would have been at home alone. If it happened 15 minutes sooner, I could have wrecked my car driving to the Y. I’m so grateful for Charlotte’s CMC hospital. 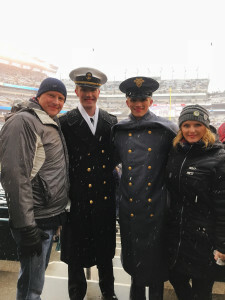 I’m currently a dance fitness instructor, I love to travel and visit my boys at the Naval Academy and West Point (proud Mom here!). The Joe Niekro Foundation would like to thank Stacy for sharing her story and giving hope to others who are going through the recovery process.